We’d love your help. 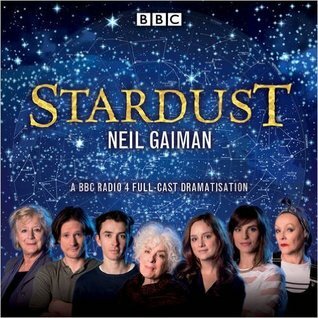 Let us know what’s wrong with this preview of Stardust - BBC Dramatisation by Neil Gaiman. To ask other readers questions about Stardust - BBC Dramatisation, please sign up. I've read the book a while ago - after having known the movie for some time. As for the past few Christmases, the BBC made a dramatisation of one of Neil Gaiman's books again - and what a great job they made of it! Stardust is about a boy living in a village close to the entrance to Fairy. It's the story about getting your heart's desire even if you're not entirely sure what that is. And it's a story about the extraordinary inhabitants of Fairy. Thrown in are funny ways of twisting and turning la I've read the book a while ago - after having known the movie for some time. As for the past few Christmases, the BBC made a dramatisation of one of Neil Gaiman's books again - and what a great job they made of it! Stardust is about a boy living in a village close to the entrance to Fairy. It's the story about getting your heart's desire even if you're not entirely sure what that is. And it's a story about the extraordinary inhabitants of Fairy. Thrown in are funny ways of twisting and turning language and magic that lies within. Although I still think the movie is better (if only because of (view spoiler)[Robert deNiro and his fantastic role as Captain Shakespeare (hide spoiler)]), this audio version has a great way of bringing the world to life, making the listener laugh and giving the story its own signature. For anyone interested, the two parts of this dramatisation will be available for about 23 more days here: http://www.bbc.co.uk/programmes/b07xs... (this is for part 1, the link for part 2 is there as well). I think it's cool they not only make these but also make them available to anyone (no geo-blocking) for a certain amount of time. A great way to spend your Christmas or the days between the years! I... actually saw the movie first--loved it!--which, I know is taboo. So I had to read the book, or rather, hear it. I'm glad that I listened to it, especially the BBC dramatisation! It was so much fun, and better than a regular audiobook. Of course, the book itself was vastly different than the movie (though, I do think I prefer the movie a bit more), but I still enjoyed listening to this! This was an amazing listening experience!!! The full cast was amazing and it brought the words of Gaiman completely to life!! This has definitely enhanced my newfound love of audio books and I can't wait to discover more from the BBC radio dramatisation. all the stars for stardust!! This is as magical as you would expect it to be. The story has translated so well to audio drama – just as other Gaiman stories have done before – and the cast were fantastic! Stardust was really brought to life in this wonderful adaptation. I will definitely be listening to it again! I decided I wasn't going to read this as I had already seen the film, but then I came across this adaptation in my library catalogue and I decided to give it a try. I loved it. I loved the story, the world, the characters, the usual quirkiness of the writing. This world was amazing and so utterly magical and so much fun, it reminded me why I love Neil Gaiman's work so much. My only complaint is that it was so short, that is why I must now read the book to get the full experience. The adaptation w I decided I wasn't going to read this as I had already seen the film, but then I came across this adaptation in my library catalogue and I decided to give it a try. Stardust may honestly be my favorite Gaiman book - followed closely by The Ocean at the End of the Lane and American Gods - and this dramatisation of the novel was absolutely lovely and magical in every way I could've hoped and wanted. As of the posting of this review there are still 13 days left to listen to it on BBC 4 Radio. Hurry now! Nicht meine Tasse Tee - selten hat mich ein BBC Radio Play so kalt gelassen. This was utterly delightful. A classic fairytale told in a whimsical way. Obviously the dramatisation of the story is not going to be the same as the actual book, so I can’t actually talk much about the writing. But the production on this was outstanding. A full cast with sound effects was the perfect way for a fairytale to be told. You just feel like you’re living this story with the characters. All the voice actors were phenomenal. I would’ve given this book five stars if I enjoyed the character This was utterly delightful. A classic fairytale told in a whimsical way. I would’ve given this book five stars if I enjoyed the characters more. Usually fairytales are more about the world and the plot than the characters so I guess that’s to be expected. Though it would’ve been nice to see a bit more growth from the characters. The storyline was fantastic. We follow Tristan Thorne as he goes to the land of Fairy to bring back a fallen star to his true love. As you can expect, hijinks and adventure ensues. It was the perfect amount of whimsy for me. Odd and charming, but not confusing. It’s just classic fairytale fantasy with witches, royalty, talking objects, magic and more. Having said that, I was a little disappointed that the world was called Fairy, yet there were no fairies, at least we didn’t come across any. Besides that I highly enjoyed the world. Stardust, to me, is the quintessential Neil Gaiman story. As much as I like Neverwhere and American Gods and Sandman, if there's one book I choose to give someone new to his fiction, it's Stardust. It's a fairy tale steeped in mythology, and if there's anything that sums up Gaiman's style, this is it. And that lovely, heartbreaking, bittersweet ending gets me every time. For all that, though, I was disappointed in the dramatization. 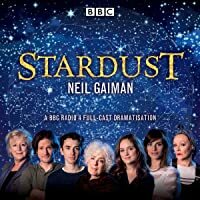 It relied too much on the narration, so it felt more like listen Stardust, to me, is the quintessential Neil Gaiman story. As much as I like Neverwhere and American Gods and Sandman, if there's one book I choose to give someone new to his fiction, it's Stardust. It's a fairy tale steeped in mythology, and if there's anything that sums up Gaiman's style, this is it. And that lovely, heartbreaking, bittersweet ending gets me every time. I just finished the book today and read an interview by Neil Gaiman where he mentions how much he loves audio dramas, so I thought I'd give it a shot. I loved it, if you enjoyed the book I'm sure you'll enjoy the drama as well. So good!!! The cast did a fantastic job and the show was really well written! I loved it m- OF COURSE. I've been wanting to read/watch stardust again and I feel like I've had my fill with this little radio show. Definitely something every Gaiman fan should have!!! This recording was really good. However, as much as I love this story, the movie is so much better than the book. With that comparison, I just cannot bring myself to give this book 5 stars. This is an excellent radio adaptation of Gaiman's (also excellent) novel. It follows the novel's plot faithfully, and the actions and characters are easily distinguished.Highly enjoyable. Loved this dramatisation, it was closer to the book's narrative and they keep the details I most enjoyed from the original story. One of my favorite Neil Gaiman stories. The BBC full cast was perfect, especially Eleanor Bron as the narrator. Very enjoyable dramatisation of one of Gaiman's lighthearted books. I think it would be easier to follow the dramatisation if you've already read the book itself first. I'm in love with this style of storytelling now. I've already put the rest of this series on my audible wishlist! Abridged and therefore felt a little too short, but still charming. This two-part dramatisation of Neil Gaiman's spellbinding novel is narrated by Eleanor Bron and stars Matthew Beard (The Imitation Game, An Education, One Day) as Tristran and Sophie Rundle (Peaky Blinders, Dickensian, Happy Valley, Episodes) as Yvaine. I do LOVE this story and it is always a joy to li This two-part dramatisation of Neil Gaiman's spellbinding novel is narrated by Eleanor Bron and stars Matthew Beard (The Imitation Game, An Education, One Day) as Tristran and Sophie Rundle (Peaky Blinders, Dickensian, Happy Valley, Episodes) as Yvaine. I do LOVE this story and it is always a joy to listen to. Here Tristran is still him, not Tristan - they changed it in the movie as it was too hard for people to say. Oh now… Dunstan Thorne married Daisy Hempstock?! Weren’t the Hempstocks the women in ‘The Ocean at the end of the Lane’? The king sets his sons against each other to prove their honour and right to rule Stormhold, an evil witch hunts down the heart of a star, a boy becomes a man, and a star falls in love. 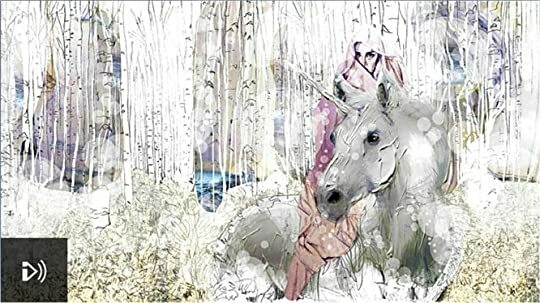 The world of fairy is populated with falling stars, brownies, unicorns, talking trees, clouds that carry people, flying ships, glass flowers and magic candles. A world where people keep their word; although it pays to make sure of your meaning. E parece que a BBC Radio 4, nas pessoas de Dirk Maggs e Heather Larmour, gostou de fazer dramatizações dos livros do Neil Gaiman. E pode continuar, que eu estou adorando! Os atores são ótimos, assim como os efeitos especiais. Nessa dramatização foram dois episódios de uma hora cada, com participações especiais de Neil Gaiman no primeiro episódio e de Tori Amos no segundo! Superb cast! The narrator was outstanding and the narration well paced. I listen for a few minutes every night before I go to bed because it has that feel of a good bedtime story (great storyteller). If you've seen the movie or have read the book, listen to this dramatization. A beautifuly written faire tale. Neil Gaiman have created a universe where I wish I could loose myself in forever. The only downside to this book is that it isn't longer. I really like Stardust; it's so Gaimanly(?) magical. This audio version involves a two part dramatisation of the novel. It is absolutely delightful and magical. It succeeds in all ways to bring the characters to life. Indeed an impressive work!